The Window on Work Values model has been built over five years from gathering individuals' responses to many questions defining work activities or situations at work that they value. The focus is on values where the primary content aspect is the type of goal or motivational concern that the value expresses. The model has good structural validity, meaning that value types close to one another in the window are related whereas those on opposite sides of the window are unrelated. The model can be applied to both Individual and Organisational values. Values focusing on the self, within an environment of Organisational Freedom are defined by the Independence value type. 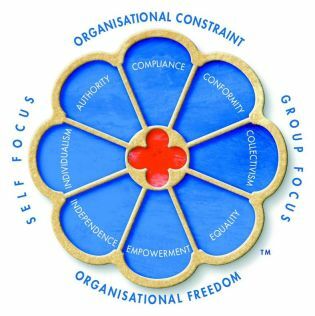 Those focusing on the self within an environment of Organisational Constraint are defined by the Authority value type. To read more on the profiles which provide feedback for this model, Please click on the folowing links.